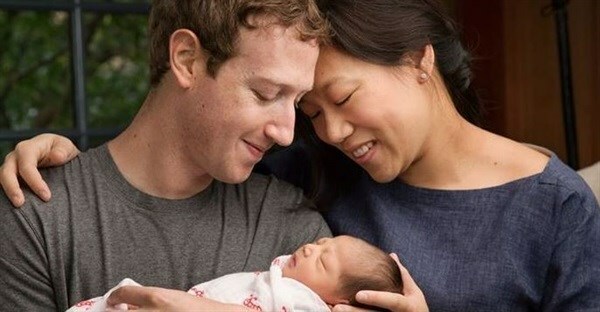 SAN FRANCISCO, USA: Facebook co-founder Mark Zuckerberg announced on Tuesday he is a dad and pledged to give away his fortune to make the world a "better place" for baby daughter Maxima and others. In a letter to Maxima posted on his Facebook page, Zuckerberg and wife Priscilla Chan said they were going to give away 99 percent of their company shares -- estimated value $45bn -- during their lives in an effort to make a happy and healthy world. "Max, we love you and feel a great responsibility to leave the world a better place for you and all children. We wish you a life filled with the same love, hope and joy you give us. We can't wait to see what you bring to this world," the letter said. Zuckerberg will "gift or otherwise direct" nearly all his shares of Facebook stock, or the after-tax proceeds of sales of shares, to further a mission of "advancing human potential and promoting equality" by means of activities for the public good, the California-based social network said in a filing with the US Securities and Exchange Commission. Zuckerberg "intends to retain his majority voting position in our stock for the foreseeable future," Facebook said in the SEC filing. "As you begin the next generation of the Chan Zuckerberg family, we also begin the Chan Zuckerberg Initiative to join people across the world to advance human potential and promote equality for all children in the next generation," the Facebook chief and his wife said. "Our initial areas of focus will be personalized learning, curing disease, connecting people and building strong communities." Zuckerberg early on added his name to those who have taken a Giving Pledge to dedicate the majority of their wealth to philanthropy. "My hat's off to Mark Zuckerberg for making a decision he'll never regret and making a difference he'll forever be remembered for," pledge-signer and former New York City mayor Michael Bloomberg said in an online post. "The traditional approach to giving -- leaving it to old age or death -- is falling by the wayside, as it should. Mark's decision shows that when it comes to philanthropy, 30 is the new 70." Zuckerberg is 31 years old, while Bloomberg is 73. Names on the pledge include Microsoft co-founder Bill Gates, Facebook chief operating officer Sheryl Sandberg, Oracle billionaire Larry Ellison and IAC/InterActiveCorp powerhouse Barry Diller. "We believe all lives have equal value, and that includes the many more people who will live in future generations than live today," Zuckerberg and Chan said in their letter to Max. "Our society has an obligation to invest now to improve the lives of all those coming into this world, not just those already here." Zuckerberg in November said that he and his wife are donating $20m to help get high-speed Internet service to US classrooms. The money is being given to nonprofit group Education Super Highway to help with its mission, the Facebook chief executive said in a post on his page at the social network. A month earlier, Zuckerberg and his doctor wife revealed plans to start a private school in a hardscrabble Silicon Valley town, mixing education with health care. Zuckerberg voiced pride in his wife, Priscilla, for the plan to create "The Primary School" in the working-class city of East Palo Alto. Last year, Zuckerberg and Chan began pumping $120m into San Francisco Bay Area schools. More than five years ago, Zuckerberg channeled $100m to improve schools in the New Jersey city of Newark in an early foray into improving public education that got failing grades. Zuckerberg plans to take two months' paternity leave to be a dad. "Studies show that when working parents take time to be with their newborns, outcomes are better for the children and families," Zuckerberg said in an earlier post on his Facebook page. Facebook also gives a $4,000 bonus for parents to help meet the needs of new babies.